@KAMIKAZE escreveu: Thor não sai mais traduzido por aqui. Night has fallen across the universe. Now seven Avengers — and one new addition — journey forth to bring back the light. But when the threat they face has destroyed even the gods…will anyone make it home? Nyx, the Queen of Night, battles the Avengers over the bodies of her victims — and Hawkeye pays the price of defiance! Rocket Raccoon comes face-to-face with his past — and it isn’t pretty! Meanwhile, the Avengers search the universe for the Shards of Night — and find trouble in the shape of the Children of Nyx! ISSUE #2 - Hidden Gem Variant Cover by JOHN ROMITA JR.
• Thanos is dead… Long live the NEW Thanos! • But who will it be?! • Will the new Guardians of the Galaxy find that person in time before the universe comes crashing down? After the SHOCKING reveals about NAMOR last issue, THE HUMAN TORCH goes deeper into the Sub-Mariner’s PAST, hoping to uncover his plan. But CAPTAIN AMERICA goes the direct route: TO ATLANTIS. Alone against THE MAD KING and his ARMIES in the exciting second chapter of WAR GHOSTS: THE AMERICAN AMBASSADOR! For months, the realms have burned with the flames of Malekith’s war, while Almighty Odin did nothing. Now Asgardia is lost in the sun, the Rainbow Bridge is shattered and the All-Father sits alone in the empty ruins of Old Asgard, drunk on mead and despair. If Odin is going to save what’s left of the realms, he’ll have to undertake the most difficult labor of his very long life. Not by being the omnipotent All-Father, but by finally being just a father to the mighty Thor. Cap accused! Cap in custody! Cap — killer? As the Power Elite makes its play against the star-spangled Avenger, Captain America is in no position to fight back! Who stands with Cap? • Who controls the eScape? Who controls the real world? And who is in control of Iron Man? • The answer to at least one of these questions is the Controller. • The answer to the others might surprise you. • It’s an all-out battle on multiple fronts with reality, the cyberscape and the heart, mind and soul of Tony Stark at stake! • The One Below All is in control, and Bruce Banner belongs to him. Hell is ascendant. • …the other is the IMMORTAL HULK. • …You think you know where a story like this is going, but you DON’T. • Because Taskmaster and Black Ant are on the scene, and they don’t have a problem with collateral damage. • Outpowered and outclassed by Terrax, Otto Octavius somehow turns himself into the COSMICALLY POWERED SUPERIOR SPIDER-MAN! • This may not be enough to defeat Terrax, but if so, is the world ready for an Otto Octavius with this level of power?! “HERALD OF DOOM” PART TWO! • A man who is trying to be a hero to his beloved nation or an unstoppable cosmic force of nature? • It’s a simple choice, unless you’re Mister Fantastic. • This dilemma, plus a strange new development in the life of the Human Torch. Hahahahaha e esse Reed Pierce Brosnan aí? Li Moon Girl And Devil Dinosaur edição 37. Legal essa edição de especial de natal, só não curti muito os desenhos, são bem cômicos mas o dinossauro parecendo uma lagartixa em algumas partes não me agradou. Essa série não foi cancelada não? nunca mais vi solicitação dela. Nessa de fevereiro que você postou algumas capas eu vi solicitação dela. Li Moon Girl And Devil Dinosaur edição 38, primeira parte de um novo arco, legalzinha como sempre. Falta agora a última edição Infinity Wars para fechar meu ano de mensais, Ms. Marvel não terá edição em dezembro. Animado com essa nova HQ, afinal é praticamente o que sobrou para mim. O mesmo cara que tá escrevendo o Miles, que você curtiu. Saladin Ahmed. O desenhista é Minkyu Jung. Eu realmente tô meio cansado do "legado" da Marvel. O que me anima mais são esses personagens novos. Ms. Marvel, Riri, Miles, Nova... acho que justamente pelas possibilidades. O velho tá muito preso ao óbvio (Thor) ou os caras metem retcon (Homem-de-Ferro) ou poderes novos (Wolverine) pra tentar mudar o que não precisa. Também vou continuar com essa série do Ajax que começou bem. Até colocaria X-Men, mas SÓ se o Ciclope voltar. Se não vou me manter longe. Ciclope já esta confirmado que vai voltar. X-Men como se resume a um título hoje, vou tentar segurar mais um tempo. Fora isso só o que o Bendis, Aaron, King e o Cates estiverem escrevendo. Devo dar uma chance para o Demolidor do Zdarsky, mas sem muita expectativa. Demolidor do Zdarsky é bem promissor. 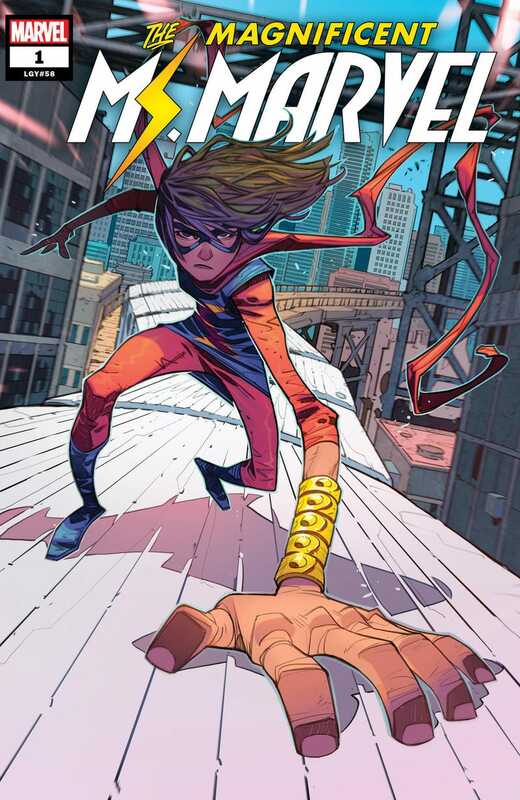 E devo dar uma chance pra essa Ms. Marvel. Gosto do roteirista, esse Minkyu Jung é bom, e essa capa tá linda. “WAR OF THE VAMPIRES” PART 3! Welcome to the Avengers, Blade — hope you survive the experience! Though there are plenty of vampires out there that definitely won’t, as the civil war tearing apart the worldwide undead community rages on. The final fate of Dracula! The Avengers vs. Ghost Rider?! Blade vs. the Shadow Colonel! And the world of the Marvel U vampires will be changed forever. Who will be the new Lord of the Damned? The Asgardians thought they were in trouble when they stumbled upon a planet full of refugees – and that was before the planet started moving. Just what have their newfound allies gotten them into?! And if the planet is this angry…what will its moon do? PRELUDE TO THE WAR OF THE REALMS! Lady Freyja struggles to protect Asgard’s refugees as Malekith’s forces grow bold! But the All-Mother won’t have to protect Midgard alone — enter Thor and his faithful dog Thori! The War of the Realms is coming — but the invasion starts here! We’ve been teasing a huge Kraven story since ASM #1 — and “HUNTED” is here to deliver it! Sergei Kravinoff and his minions have been kidnapping animal-themed characters for months, but they need one more to complete the collection — the Spider. But what does Kraven even want with all of them?! Find out in “HUNTED”! • Kraven’s plan begins to unfold in CENTRAL PARK! • He lets the prey loose and the hunt begins. • But Kraven isn’t the hunter this time. Who has Spider-Man in their crosshairs?! THE DEADLY CATACOMBS OF KOGA THUN! • But what secrets does the trove hold, and can Conan trust his compatriots? • No matter--the undead forces of KOGA THUN have other plans for the barbarian! • PLUS: The next chapter in an all-new CONAN novella, running through the SAVAGE SWORD OF CONAN series! KING CONAN REIGNS AS “THE LIFE AND DEATH OF CONAN” CONTINUES! • But even a monarch must face the cold embrace of death! • The legendary adventure continues as the CRIMSON WITCH makes good on her threat to King Conan! • PLUS: The next chapter in the ALL-NEW Conan novella “BLACK STARLIGHT,” begun in issue #1! ISSUE #1 - The Warners are your typical family. Dad works at Stark. Mom works in a senator’s office. Jennifer and Alice are students at Stamford High School. The only thing that makes them different is that they’re shape-shifting Skrulls and have infiltrated our society to pave the way for a Skrull invasion. Robbie Thompson (SPIDER-MAN/DEADPOOL) and Niko Henrichon (DOCTOR STRANGE, Pride of Baghdad) bring the Marvel Universe down to earth with a bold new look at the Skrulls that will test even YOUR loyalty. No costume, no shield, trapped behind bars with a thousand villains and killers who’d like nothing more than to see him dead, Steve Rogers fights back — and he can do it all day! • Betty Ross is going through a lot. She’s having a family crisis. Her employers won’t pick up the phone. • And at her door is the husband she thought was dead. But Bruce Banner hasn’t come alone. • He’s brought the IMMORTAL HULK. “STARK REALITIES” continues with “THE IMPOSSIBLE ARMOR”! Iron Man isn’t a suit. It’s an idea born from the mind of Tony Stark. And in a place where thought and reality are one and the same, a place where Tony’s imagination is unchecked, what kind of terrifying, all-powerful Iron Man armor will be born?! “HERALD OF DOOM” continues with “FIRST-WORLD POWER”! Latveria is about to take its rightful place on the world stage. Thanks to the benevolence and ingenuity of your beloved leader, Victor Von Doom, Latverians will soon know a new age of peace and prosperity! All of this shall come to pass — as long as we can repel these four nefarious foreign invaders who have illegally entered our beloved country! Death to the Fantastic Four! SPIDER-MAN VILLAINS VARIANT COVER BY GREG LAND • After the incredible #400, Doc is finally face to face with the man who controls Earth’s magic! • What chance does Strange have against a foe who can literally turn Strange’s spells off?! • The Dark Guardians ascend! • With a new Thanos rising, the galaxy calls for a group of heroes who will use any means necessary to end this threat. • Unfortunately for Star-Lord, that’s NOT the Guardians of the Galaxy! Caceta isso já me empolgou MUITO! E PUTAQUEPARIU SAI DAÍ Ô CRIANÇA DOS INFERNOS!!! E essa série MEET THE SKRULLS? Achei interessante, principalmente por ser do Robbie Thompson. Eu sei que não deveria comparar, mas seria bem legal uma série assim nos moldes de Visão. Focando na família e tal. É esse tipo de coisa que tem me animado nos quadrinhos. Propostas mais ousadas e desapegadas da cronologia. Eu ia gostar muito se a Marvel retomasse aquela Hank Johnson, Agent of Hydra. 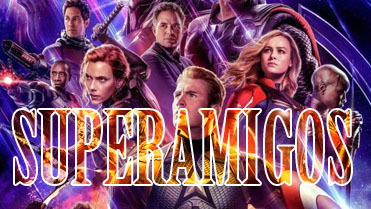 Li a edição 6 de Infinity Wars, que saga fraquinha. Não achei por completo ruim, mas esperava mais.